If there is a Greenlander “type” (and if not, take a moment come up with one) Malik would be it: he is taciturn, bearish and mildly hedonistic bachelor. He’s a carpenter, good with his hands, not terribly articulate, living with his similarly-reserved grandparents. He lives in Nuuk, the capital of Greenland, where there’s not much to do but work, hunt, drink and pick up women (all of which Malik does well). He spends a lot of time with his friends, Inuit cousin Mikael and baffoonish Carsten, the latter of whom ends up in the hospital after an overdose of Viagra, but it is Malik who receives bad news: he has cancer and not long to live. Forced to decide between leaving for Denmark for treatment that may extend his life or spending his remaining time with friends, family and the girlfriend he has never quite committed to, Malik finds himself suddenly face to face maturity and mortality. He isn’t quite ready for either. Choosing to keep the news a secret, he takes a boat trip with Mikael where they shoot a half-baked commercial, crisscross the craggy fjords of his homeland, camp with a heartsick tourist and confront a reclusive shepherd with the key to resolving some long-smoldering family issues. Nuummioq is the first fully Greenlandic production and their first submission to the Academy Awards. The dialog is in both Greenlandic (the language) and Danish. Director Otto Rosling, a first-time filmmaker, shows remarkable craft, compassion and assurance, but one can also sense his melancholy and depression (channeled by his younger brother Lars Rosling as Malik) that would eventually require screenwriter Torben Bech to step in to help finish the project. 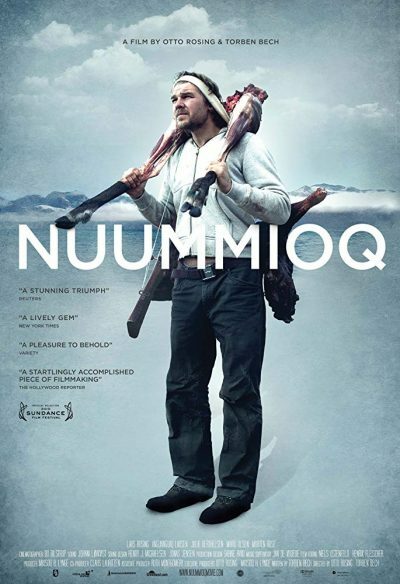 Nuummioq doesn’t always succeed at tapping into its profounder themes, but it works as a mood piece and a satisfying, intimate character study; a portrait of an average man involuntarily reevaluating his priorities. The natural acting and overcast cinematography carry the film, taking us leisurely across outwardly spare physical and emotional landscapes that harbor a rugged richness and unanticipated depths.